How to get to the Brit Hotel Orléans St Jean de Braye - L'Antarès ***? Located only 130 kilometres from Paris, Orléans is considered by many tourists as the last stop before the Capital. The Brit Hotel Orléans St Jean de Braye - L'Antarès is located 134 kilometres from the foot of the Eiffel Tower. In addition, many people from the Ile-de-France region come to the Loiret to escape on the Loire walks or to enjoy the great forest of Orléans! Finally, the access to the Tramway is very appreciated by our customers (Stop Clos de l'Arche); you will find all the practical information at the reception desk. On the A10 motorway, coming from Paris, take exit 14 towards E60 / Montargis / Fleury les Aubrais / Saran and Orléans Nord. You arrive, then, at the toll gate. Now you join the A701 where you will take, after 3 kilometres, the exit towards the E60 / Montargis / Nevers / Fontainebleau / Fleury les Aubrais. From now on, follow the main road in the direction of Fleury les Aubrais, for 5 kilometres and take the exit towards Saint Jean de Braye Centre. Continue towards the town centre of Saint Jean de Braye. Cross 3 roundabouts following Saint-Jean de Braye and turn right, rue du Coin Buffet. Your Brit Hotel Antares will stand before you. You are currently on the A10 motorway and arrive at the junction with the A71 where you will take towards Vierzon / Orléans Centre / Orléans La Source. On the A71 motorway, take the 1st exit towards Orléans Centre / La Chapelle Saint Mesmin / Saint Jean de Ruelle. When you enter the commune of La Chapelle Saint Mesmin, take the 2nd exit at the roundabout towards Orléans Centre. At the end of the street, turn left again following Orléans Centre on the N152. Then, follow the Loire while remaining always on the N152 during 7 kilometers. You have arrived at your Hotel Antares. If you wish to avoid the traffic lights of the city centre, we advise you to go up the A10 and exit at exit N°14 towards Le Mans/Montargis/Fleury-les-Aubrais/Saran/Orlêans/Pôle 45 and follow the detailed route above (same route as if you come from Paris). From these starting points, you arrive in Orléans by the A19 motorway where it is necessary to take the exit number 7 in the direction of Pithiviers / Neuville aux Bois. 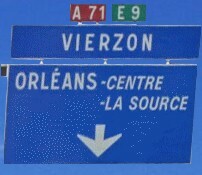 At the next roundabout, take the direction of Orléans. From this point, you have 30 kilometres of straight on the N152 before joining your Brit Hotel Orléans St Jean de Braye - L'Antarès which will be on your left.